A while ago on Picturebook Den I asked the question What is a picture book? I was writing about different kinds of picture books, board books and longer picture books, and asking for your favourites for little ones. But there are some picture books which are in that grey area and beg the question - who are they aimed at? Two in particular spring to mind that are picture books, but I am fairly sure neither of them will appeal to the majority of parents of small children, for completely different reasons - although I am prepared to be convinced otherwise, if you can come up with a good argument. But perhaps that is not who they are aimed at? I am sure that ardent fans of both writers love the books and I must say I have enjoyed both of them for different reasons, but I am still not sure I would read them to under 5's! So who are they for? 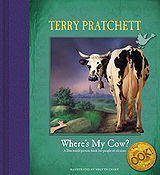 The first book... Terry Pratchett's Where's My Cow? I will admit to being a Pratchett fan and this book probably appeals in the first instance because it is set in his famous Discworld featuring Sam Vimes of the City Watch who is reading a book to his little son. I love the way it shows two different stories (well three, really) at the same time. This is where the book changes. Images becomes a little darker although still humorous, as the less salubrious characters from Ankh Morpork are suggested as possibilities, with the first being Foul Ole Ron. We all know how quickly children, particularly tinies, repeat anything they hear and I can just imagine those little copycats repeating that gem as they trip up the steps to nursery! For the adult or older child it is a fun book although for those not accustomed to buying and reading picture books it may seem very short and, as at least one reviewer says, very expensive for such a short book! I personally think they have missed the point. A story is as long or as short as it needs to be and the illustrations are eye catching and a lot of fun, even more so if you are a Pratchett fan already. BUT who is it for, and does that really matter? The second book... is one I saw a while back, The Wolves in the Walls, by Neil Gaiman. I have to admit when I first picked up this book I was put off by the illustrations. They were just not appealing to me, which is not to say others will not find them wonderful. I remember my first reaction to the book was that the story coupled with these illustrations made it seem a terrifying book for young children. I don't know that I paid enough attention to the text at the time but I wasn't inclined to stay with it. and the story, being read to me, created quite different and much brighter images in my mind. It was much more appealing than the book had been. I still think it is the kind of book that would give a lot of children nightmares and personally I would have wished that the lovely language (and the way the story was told) had been paired with much gentler images that would have taken away a little of the scariness and made it more accessible to younger children. But perhaps that is not what the author wanted anyway. His young daughter is on the CD interviewing him. I don't suppose he was trying to give her nightmares, they sound great together, so perhaps he is blessed with unscare-able children! Who do you think they are for? Or does that matter? Can you suggest other picture books that are similarly not particularly suitable for young children, for whatever reason? I agree Abie, children need all kinds of books and they need serious, sad and sometimes slightly scary things in them. I don't believe in only giving young children safe, cuddly books all the time, when they have to learn how to cope with real life, which is not going to be sweet and cuddly all the time. But I think there is a way to tackle difficult issues in picture books and a way to deal with difficult emotions while still providing a safe environment. I am not sure a book that is full of nightmarish images as well as a scary premise is likely to do much more than give them nightmares! The other question is whether these books are written with children in mind, or are they for the child within us as adults? I'm intrigued to read the Terry Pratchett one now. I guess because he's famous for writing for adults, he knows he's got a market whoever he writes for. As for the Wolves in the Walls, I've not read that one, although I keep meaning to, but we've got 'The Day I Swapped my Dad for Two Goldfish' which is written by Neil Gaiman and illustrated by Dave McKean and it's brilliant. I love Dave McKean's illustrations as well as Neil Gaiman's text. It probably appeals more to my children now they're older (from about six up, in particular), but I'm all for older picture books. I'm really looking forward to The Wolves in the Walls. It might be too scary for my sensitive children but I'll read it first before showing (or not showing) them. Ones like The Day I Swapped... can also be great for reluctant older readers who appreciate 'older' pictures. As for Michael Rosen's Sad Book... amazing book but written for adults as much as children (and all the now adults who grew up seeing pictures of Eddie drawn by Quentin Blake). Makes me cry, too. Thanks. The two goldfish story was on the CD, too, and I am sure it makes a great book! There is this whole issue about how picture books are perceived and even children think they grow out of them but then they get older graphic novels come into their own. I am not saying that picture books have to be for the very young but in the general populace there is that assumption so it is worth discussing I think! I have to admit I have heard of Michael Rosen's Sad Book but I've never read and I am now keen to get it. Death is such a powerful and hard subject to get right in any book but perhaps more so in a picture book. I don't know the Terry Pratchett, but the Wolves in the Walls is a wonderful book. Scary, yes. For young children, no. I think it's a shame that in the UK it's very hard to publish picture books for the older age-range - as is vastly more common in the European market. Here you seem to need to already have a name for older readers - Gaiman, Pratchett, Rosen etc, for a publisher to take the risk. But why shouldn't older children and adults have picture books made specifically for them? Shaun Tan, for example, is doing amazing things these days - if anyone hasn't seen The Arrival I urge them to. For young children, no. For everyone else? YES! Hear, hear, Malachy. Why shouldn't beautiful illustrations of the type we get in picture books not be offered to older children? It's 'the market' again, I suppose. Back to the scary picture books - I like a bit of 'scary' and I think that often children are very knowing, enjoy it and can cope - though it would depend on the child, of course. Some of those old Arthur Rackham-type illustrations are very scary! But, yes, the truth is that publishers allow these already famous authors to take risks only because they have guaranteed sales. Way of the world. Thank you for the post, Linda. I'm going to order that CD for myself! Interesting blog, Linda. I often skim the picture books in bookshops and think to myself that although I like the book, it wouldn't be relished by a four-year-old child. It's a fine line between writing a book to be enjoyed by both parent and child, and not veering too far to the adult. Plus yes, children do vary. Mine wouldn't have enjoyed anything scary but would have enjoyed a sophisticated book. However, I'm currently trying to find fun, riveting picture books for a four-year-old with a very short attention span and little experience of the world and listening to stories, and strangely I'm finding it difficult. 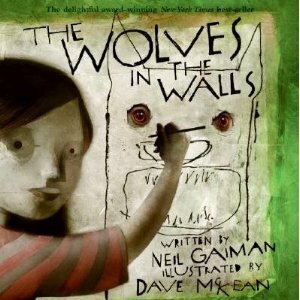 I absolutely ADORE Neil Gaiman's THE WOLVES IN THE WALLS. Scary, but can't imagine a child not loving it (no one under four, though). The Terry Pratchett book is a spin off from his longer books, and really for grown ups who can share the references. My son's favourite was an American picture book about baby creatures finding the right place to sleep, and he was usually closing his eyes by the end of it - so soothing. I have no idea who wrote it. And then there was Nicholas Bunny - who wrote that? 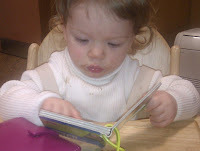 It's always difficult to judge how a child will react to a picture book. I thought "Mr Bear and the Bear" was too mature a story for preschoolers but my 4 year old grandson wanted it over and over again. I think there's definitely a role for picture books for older children, especially with children who don't read well. 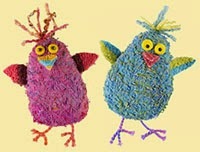 I even put a page about them on the reluctant readers section of www.wordpool.co.uk.